We loved creating family memories. The cabin had every amenity needed. Beautiful views and great accommodations. We loved the Polar Express. 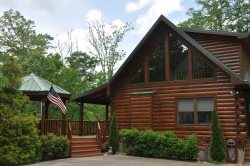 We have worked with Great Smokys Cabin Rentals for the last several years because their website is easy to use and book our stay. They also offer a nice discount for return customers. Cathy is always very responsive and answers any questions we have. We loved the private location and went fly fishing. It had everything we were looking for such as: Mountain top view, Fireplace, hot tub, fire pit and pool table was a plus! We loved sitting in rocking chairs in the morning and evening looking out over the mountains! Thank you so much for sharing your beautiful cabin. Absolutely loved everything from the amenities to the beautiful dcor. The beds were very comfy and the cabin was stocked with everything we needed. We will definitely be back! Our stay was wonderful. The cabin had everything I was looking for at the right price. We went on the train ride and white water rafting. My boys loved the hot tub! Overall, our stay was fantastic! We had a great time this week! First time in this area and we loved it! The cabin is gorgeous and clean! We were able to relax and enjoy our family as well as many local activities! It rained more than it didn't, but we did not let that stop us! The cabin was beyond what we expected! It was very clean and fully equipped, no small detail was overlooked. We enjoyed the plethora of local and historical information. This rental agency was great. Anytime I called, whoever answered was always very friendly. The view was amazing. Thank you for making our family vacation extra memorable. Cabin was beautiful with a great view. It had lots of amenities and was well stocked. Very spacious. It was perfect for our multi-generational family. We enjoyed our Spring family vacation. We had a great time. The house is beautiful with so many amenities. We've been coming here for may years and this is the best house. Amazing views! Comfortable beds. Complete package. Hiking, rafting and just relaxing. Thanks for opening up your lovely home. Thank you so much for the great memories! The kids had a blast and the adults were able to relax and unplug for the weekend. Thank you for hosting us at your beautiful cabin. This has been our 5th year coming to the mountains for Thanksgiving. This has been by far the best experience that we've had. The cabin is spacious, well equipped and decorated with the Christmas spirit. We appreciate the fact that you treat your cabin as a home rather than a rental property. We came to this beautiful cabin to escape the hurricane. We love the mountains and fell in love with this place. My kids loved it up here. Thank you for everything. This cabin is gorgeous. Thank you for the wonderful place and homelike feel. We came down from Toledo, Ohio for a family reunion over on Brush Creek. We went rafting as well. NOC was the perfect place for that. Thanks again! Loved the cabin and the views. Came to NC to view the solar eclipse and it was fabulous watching from the yard with just the family - No Crowds! We would love to come back. We loved the views! Rain, sun, beautiful 'smoke' in the valley and starry skies! This was a perfect relaxing weekend for us. Very impressed with the completeness of the kitchen and the cleanliness of the cabin!